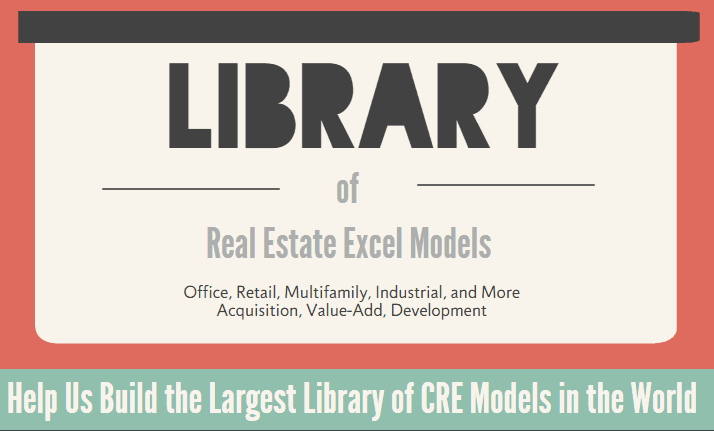 Over the years, I’ve received various requests to augment our library of real estate Excel models to include a model for underwriting and analyzing commercial mortgage loans. 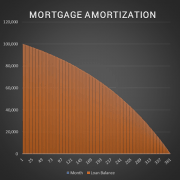 Specifically, people have asked for a tool to calculate the loan amount (ie. 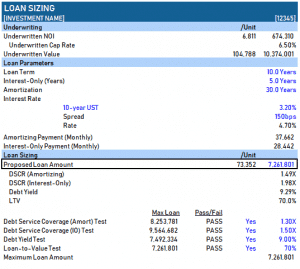 loan sizing) based on a combination of tests – debt service coverage ratio, loan-to-value, and debt yield. 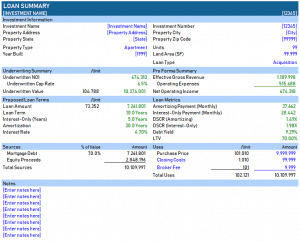 In response to that, I built this commercial mortgage loan analysis model. In addition to both the underwriting and loan sizing modules included in this standalone model, I also added a variation of my refinance analysis tool that uses the underwritten NOI and loan sizing assumptions as a baseline to sensitize the future balloon risk. I hope you enjoy this one! The model is likely also backward compatible with older versions of Excel, since I’ve not used any VBA in the model. Nonetheless, I have not tested it with older version of Excel. To help you get started with the model, below I’ve written a description of each tab, embedded a video walk through of the model, included a link to download the model, and listed changes to the model by version. Investment Information. In this section, the user enters general information about the investment such as name, address, property type, and size. Loan type (e.g. acquisition vs. refinance) is also selected in this section. Underwriting Summary. 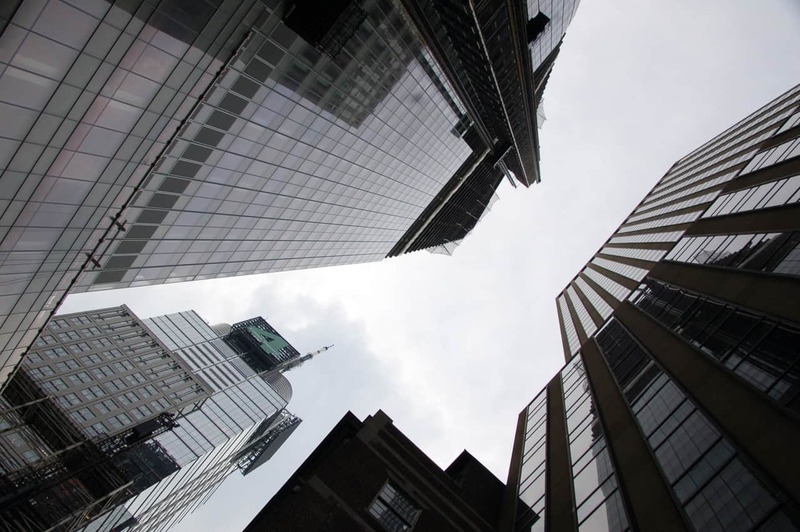 A basic summary of the underwriting results from the Pro Forma tab are reported here. 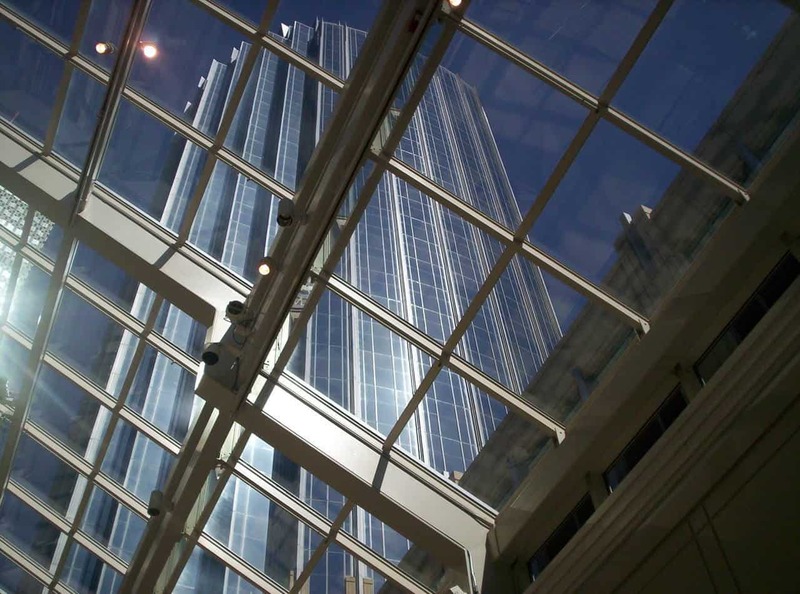 This includes underwritten net operating income, underwritten cap rate, and underwritten value. Pro Forma Summary. 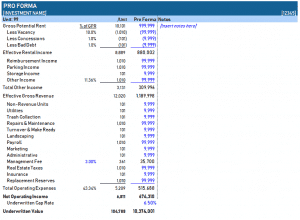 The Pro Forma summary section shows the effective gross revenue, operating expenses, and net operating income. Proposed Loan Terms. This section includes the loan terms as selected on the Loan Sizing tab, such as loan amount, loan term, and interest rate. The section also outputs the expected balloon balance of the loan at the end of the term. Loan Metrics. 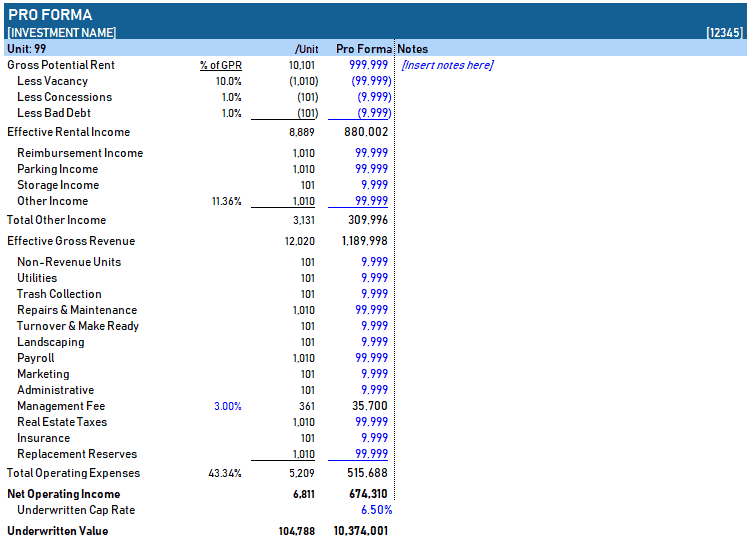 The model then calculates various loan metrics based on assumptions entered on the Pro Forma and Loan Sizing tabs. Loan metrics include payment, DSCR, debt yield, and LTV. Sources and Uses. A breakdown of the sources (e.g. debt and equity) and uses (e.g. purchase price, closing costs, etc) for the investment. Notes. The tab concludes with a notes section, where the user can enter salient comments about the loan opportunity. 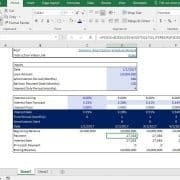 In this tab, the analyst uses the direct capitalization method to arrive at an underwritten value for the subject property. 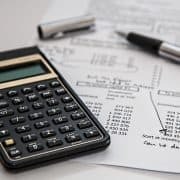 This involves making assumptions for rent, other income, and expenses to solve for an underwritten net operating income. I’ve included an apartment operating statement as default, but the user should add/remove rows and change income/expense labels as the property type dictates. So for instance, if you’re underwriting a retail property you’d likely remove the Parking Income line, and rename the Storage Income line to Percentage Rent. You may also separate Reimbursement Income into CAM Reimbursement and Tax Reimbursement. Finally, you’d edit the expense line items to more closely match the expense items found in the historical operating statements. With the Pro Forma complete, the user then enters a market cap rate. The model then takes the underwritten net operating income and assumed market cap rate, and automatically calculates an underwritten value. The net operating income and underwritten are key components for sizing the loan (see next section). Along the right-hand side of the Pro Forma, I’ve included a notes section. It is within this notes section that the user enters comments and justifications for the assumptions she used in her Pro Forma. So for instance, if the user entered $120,000 for parking, she might write the following comment immediately to the right of that Parking Income assumption: “$100/month x 100 parking stalls”. One the Loan Summary and Pro Forma tabs are complete, the user calculates a proposed loan amount using the Loan Sizing tab. This is done first by entering proposed loan perimeters such as the loan term (in years), the interest-only period (in years), the amortization period (in years), and the interest rate. The interest rate is the sum of the proposed benchmark rate (e.g. US treasury rate) plus some loan spread. 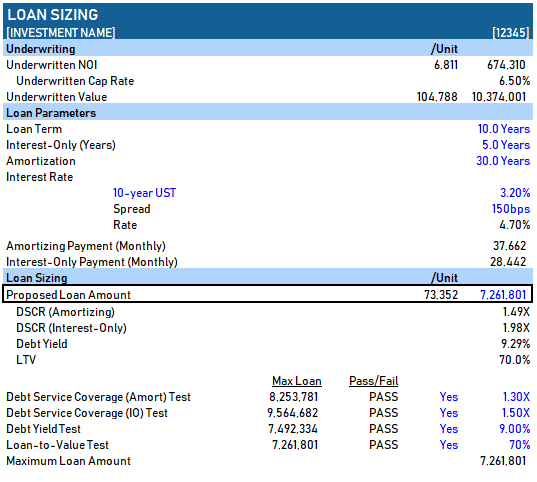 With the loan parameters set, the user then sets tests for debt service coverage ratio (DSCR), debt yield (DY) , and loan-to-value (LTV). These tests solve questions such as, what is the maximum loan amount such that the payment does not exceed some user-set DSCR? Or what is the maximum loan amount, such that the resulting debt yield is not less than some user-set minimum debt yield? The Maximum Loan Amount, based on the minimum DSCR, minimum debt yield, and maximum LTV as set by the user, is calculated at the bottom of the Loan Sizing tab. That value, by default, is automatically entered into the Proposed Loan Amount cell contained within the bold black box at the top of the Loan Sizing section. While the Proposed Loan Amount cell contains a formula linking it to the Maximum Loan Amount cell, it is nonetheless an input (blue font cell) and can be changed manually by the user. However, if the value entered into the Propose Loan Amount cell causes one of the DSCR, DY, or LTV tests to fail, an alert will appear next to the failed test. As an added bonus, I’ve inserted my Refinance Analysis tool into this model. If you recall, refinance risk relates to the possibility that the borrower will be unable to refinance the balloon balance at the end of the loan term. This occurs when either net operating income falls, interest rates rise, or market loan metrics (e.g. 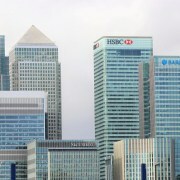 DSCR, DY, LTV) for sizing loans change. To learn more about how to use this tool, read the tutorial and watch the video for the Refinance Risk Analysis Tool. 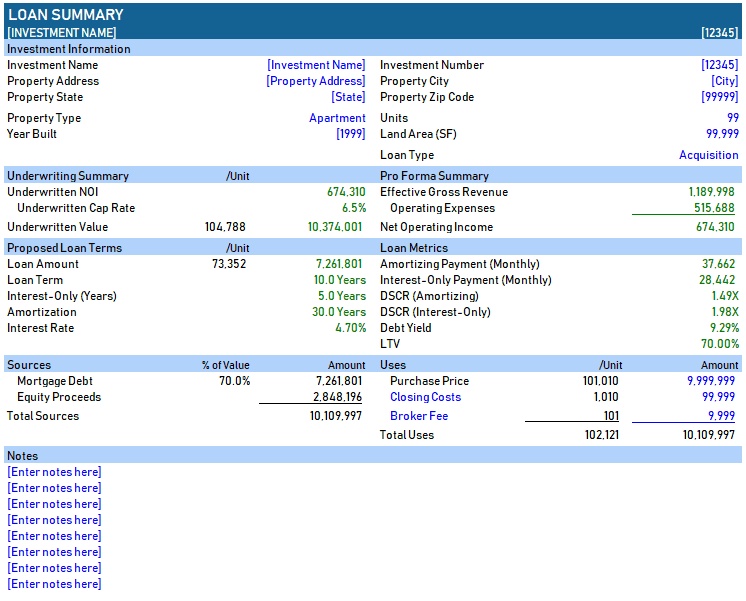 The model includes two drop-down menus – property type and loan type. The list of items that appear in those drop-down menus are housed on the Data tab. Additionally, the unit type labels for each property type (as shown in heading of various sections) are entered on the Data tab. At anytime, changing the values in either the Property Type or Loan Type lists on the Data tab will change the values in their respective drop-down menus on the Loan Summary tab. This allows the user to add or delete property types from the model. It also allows for future customization of the model to include other loan types (e.g. construction loan).